Some EPS staff members were at school early on Saturday morning getting out tables and chairs, preparing the front row for two of our oldest visitors to sit in, making sure big and little jobs had been done. Caterers had prepared these boxed lunches and were also serving orange juice, water and cups of tea or coffee from our kitchen inside the Multipurpose Room (our hall). 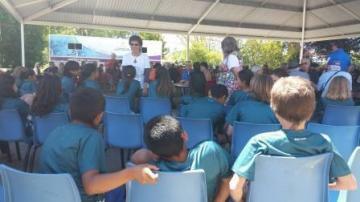 Some children came to school on Saturday morning with their parents. 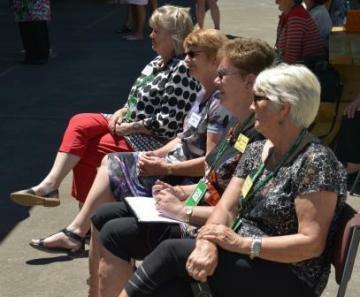 They came to help entertain our visitors with Kapa Haka songs and Jump Jam dance moves or they were helping to do jobs or show our visitors around the school. 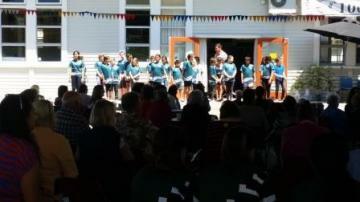 Some of Whaea Jeanette's class made up the Kapa Haka group with a few students from Room 4. The main helpers were the Lockwood students (Year 7 - 8) from Friday and were still doing a great job helping our visitors whenever they could. 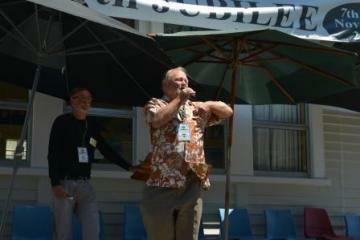 Once our visitors (or most of them) had finished their lunch, our school started with the formal part of the Jubilee, by starting with a Karakia with Matua Brett and three of his students from Room 4. 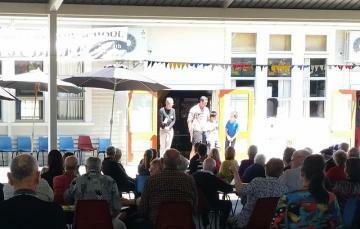 Before the entertainment group could perform, Te Aniwa (her brother Maihi was in the 'Discovering Edgecumbe' story from 2013 and her mum is Naumai, our B.O.T Chairperson) and Josh greeted the crowd. They explained what the group were going to perform. The entertainment group began with Kapa Haka songs and then danced and boogied away to some Jump Jam songs. Here are some of our staff members watching the entertainment and speeches. 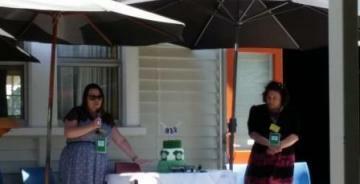 After the entertainment group Naumai, our Chairperson for the Board of Trustees (Katera, Te Aniwa and Maihi's Mum), greeted the visitors and presented a lovely speech about what EPS was like today, the learning that goes on and the exciting things the children at EPS get to do. 'Whakaaro pai ki te tangata' .... 'I Care, We Care'. A - Achievement - I show 'I Care', I will achieve! E - Effort - My effort and especially my attitude, affects my performance and my achievement. Mr Davey introduced Mr Clark next. Mr Clark used to be a student at our school. His wife is Mrs Clark who is a teacher in one of the Year 3 - 4 classes. Mr Clark is very good at speaking and always has something funny to say. Mr Clark is very clever and knows a lot of history about the Rangitaiki Plains area where our school is in the middle of! 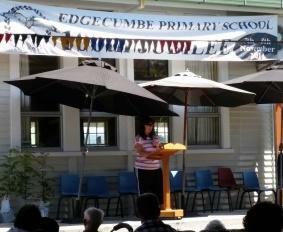 Mr Clark talked about lots of different things growing up in Edgecumbe and he described an incident that happened a long time ago at EPS when he was a student. His friend was going to be punished with 'the strap' (if you were naughty, you got a 'whack' on the hands with a leather strap) but his friend stole the strap before it could be used and cut the strap up into little pieces. The friend then gave all the pieces out to his friends. Mr Clark has one of those pieces and it was in his pocket on Saturday! You can see Mr Clark pulling it out of his pocket. 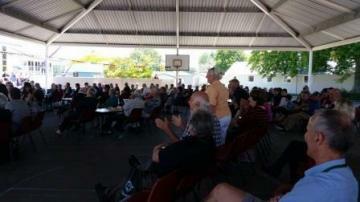 Mr Clark had the crowd joining in with his speech. 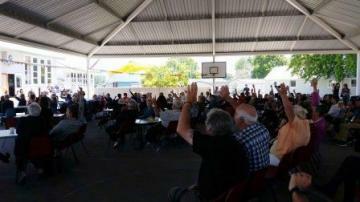 Mr Clark had people from the crowd stand up or put their hands up at different times in his speech for different funny stories. After Mr Clark's speech, Mr Davey introduced the most exciting part of the day...the birthday cake! The birthday cake was created by Miss Flynn's friend in Auckland. It was beautiful looking! 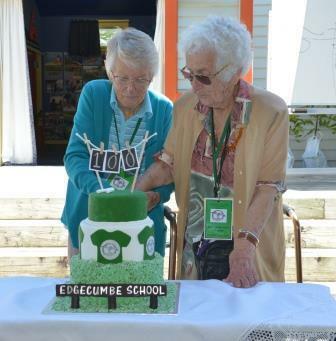 Miss Flynn and Mrs Reid brought out the cake. Miss Flynn explained who had created the cake and why she had made it like this. 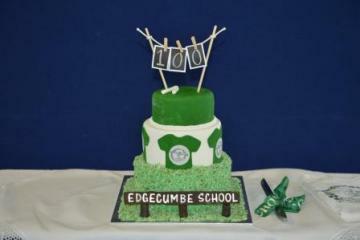 Our school colours are green and white. It has grass - we are a farming community. The little t-shirts have the school's logo in white and black on the front and of course, the sign shows how old EPS is. 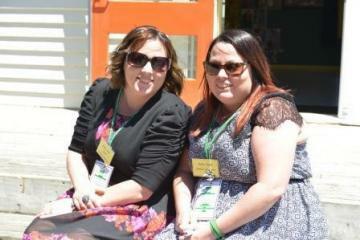 Here is a close up photograph of Mrs Reid and Miss Flynn. Everyone sung 'Happy Birthday' and then the oldest visiting students cut the cake. This photograph of our lovely ex-students was on the front page of the local newspapers and the local weekend newspaper. Joan Dent (blue cardigan) came to EPS between 1927 - 1930 and Mary Barr came to EPS between 1928 - 1936. After the song, the cake was cut into lots of small pieces and given out to all our visitors and staff. While the cake was being shared out, Steve our photographer was starting to organise ex-students into class years so he could photograph them. He started with the biggest 'decade' group which was the 1950s. Sorry, Whaea Lesa cannot show this photograph as she did not get permission from everyone to show their photograph but here is the sign. 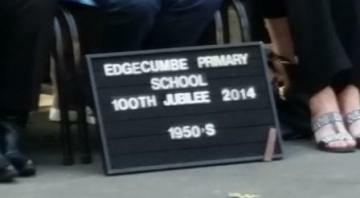 At the bottom right of the sign is Mr Clark's 'piece of strap' he has had for many years! During the photographs were being taken, Mr Brebner (and anyone who wanted to go with him) was meant to have planted some more native trees...BUT...no one could find the spades or shovels! So, the trees had to sit in the staffroom a few weeks until they were planted 'for real'...on the last day of school, the 10th of December! You can see our lovely new trees on the 'EPS Finally Plants our Trees' page. Eventually Steve got to photograph students from the 1930s, 1940s, 1960s, 1970s, 1980s, 1990s, 2000s and then the 2010s. 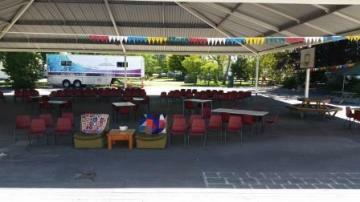 In our decade, 2010s, we had students, parents and staff. 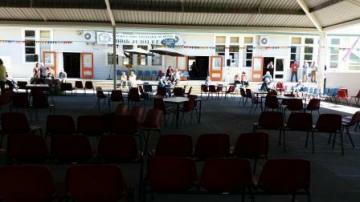 While the last photographs were being taken, the EPS staff and Committee began to pack up all the tables and seatings. Most of the visitors had gone home or had gone into town for private dinners by this time. Some visitors stayed to talk to their friends and present staff or stayed to just look at the school buildings. 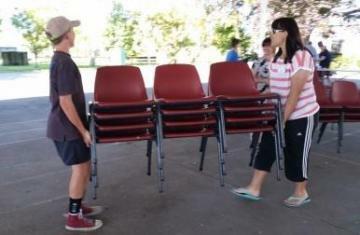 Here is Jacob (his Nan and Grandad is featured earlier in this story as visitors) and Naumai helping to stack seating away at the Wharenui just next door. What did Room 7 Children Think? Did the visitors enjoy themselves? Yes because they saw their friends and got to see their classrooms again but not the really old people because the classrooms have all changed. Yes because they sung 'Happy Birthday' and got some cake. They had a yummy lunch and had their photos taken like when they were at real school. Maybe. It was a long day and old people can get tired like us. Yes because our school is nice and clean and we have 'I Care' at our school. 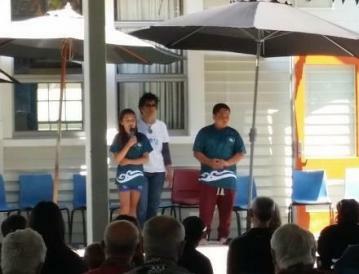 We enjoyed ourselves (Whaea Lesa and Whaea Niki) very much on Saturday and we also hope the ex-students enjoyed themselves as well. The next day, on Sunday, another visitor arrived. Pauline had come to the formal celebrations on Saturday but returned back to EPS for another visit. 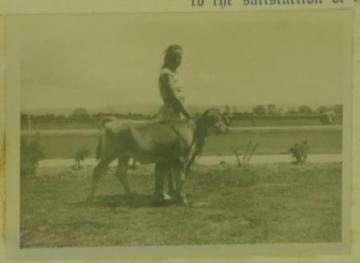 When Pauline was a student at EPS, she won a certificate for 'rearing the best calf'. That was in October 1960! 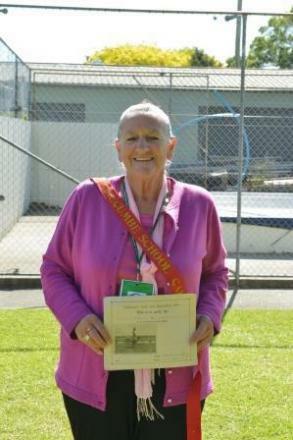 Here is Pauline with her certificate and her ribbon. Pauline also told Whaea Lesa, she was invited to be a Junior Judge at the Awakeri School calf day that same year because she had won a certificate at EPS! WOW!!! Whaea Lesa was hoping to find a clearer photograph of this 1960 event but hasn't found one yet...BUT...if you look closely, there is a black and white photograph of Pauline on the certificate. Whaea Lesa tried to make this photograph bigger and as clear as she could.